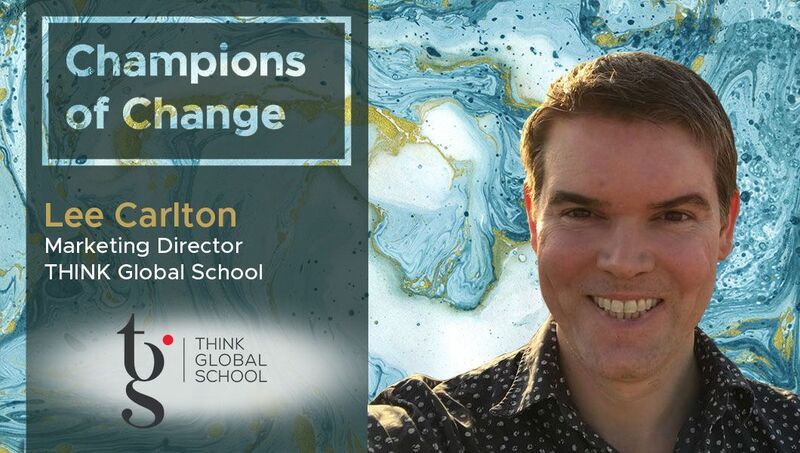 Lee Carlton: My name is Lee Carlton, and I’m the marketing director at THINK Global School (TGS), the world’s first traveling high school. The school was founded by Joann McPike, an intrepid traveler herself, after she realized that no real options were available for high school students to gain an education in the world firsthand. Not long after that initial “ah ha!” moment, her son Alex, thirteen other incredibly adventurous teens, and a handful of teachers set off on the school’s initial educational journey in the Fall of 2010. That year students spent terms in Sweden, Australia, and China, and we’ve been traveling across the world, interacting with diverse cultures and offering a pathway to global citizenship for curious students ever since. To be fair, the school has grown and transformed in a multitude of ways since then (pretty much all for the better), but we feel we are closer to honoring Joann’s vision of a school where travel, cultural immersion, and empathy serve as core values than ever before. This year we launched a second cohort, bringing our total number of enrolled students up to sixty, and those students themselves hail from all across the world. Lee Carlton: I think that digital technology is having a profound impact on the field of K-12 education, and unlike other areas of education that are outdated (standardized testing, teacher-led instruction), students are genuinely benefiting from the integration of digital technologies in the classroom. Kids are digital natives; they’ve been around devices their entire lives, and are comfortable engaging with new learning opportunities through apps and online instruction. Not just that, but digital technology presents opportunities for every student, no matter their background, to explore the world remotely, something we’re big fans of. Are there pitfalls to the digital transformation of the classroom? Of course — digital devices present all types of distractions that weren’t necessarily present in the classroom before, but overall the benefits in my eyes far outweigh the negatives. Regarding the introduction of tech solutions, at this point, we’ve largely gotten it down, but it was a journey. Given our nomadic model, we travel fast and light: all of our files are stored online currently through our project-based learning software Headrush and a handful of other solutions such as Google Drive. We’re a 3:1 school, which means that each student is issued a MacBook Pro, iPad, and iPhone upon their admission into the school. They use all three of these tools in a multitude of dynamic ways during their time in country and at home, and it’s been really amazing to see their digital skills flourish as they progress through grades. Before our students land in a new country, they engage in what is known as “pre-explore,” where they spend a week online completing lessons pertinent to their upcoming destination. We’ve found that giving them a chance to engage in blended learning like this lets them hit the ground running, and they arrive knowledgeable and ready to immerse themselves in their host country and lessons. Again, this is all done through online solutions, and we’re able to check on each student’s status at any time to see when they’ve last logged in, how much they’ve completed, etc. People tend to focus on the travel component of our school, but we’re just as proud of our tech integration and curriculum. Regarding our Changemaker Curriculum, it’s based on a place- and project-based pedagogy, and central to that is that learning is student-driven. If students find through the course of their studies that they have an interest in computer science, we are going to help them pursue that; likewise, if they gravitate towards creative arts or graphic design, we’ll equip them with the skills to be successful in that, too. It’s one of the things that we think sets our model apart — a focus on mastery, autonomy, and purpose. And because of it, our students are happier and more engaged. Lee Carlton: I think the rise of augmented, mixed, and virtual reality in education is the trend that possesses the potential for the most significant impact. We’ve begun exploring it ourselves — one of our teacher-led modules (lessons in project-based learning that are guided by an educator) this term in Hiroshima is exploring how virtual and augmented reality can be used as tools of social justice and empowerment in classrooms around the world. They are incorporating the Oculus Rift into lesson plans and having a blast doing so. Next year in Australia we’ll have a similar VR-focused module. For students around the world, who again can’t travel like ours, virtual and augmented reality offer opportunities to learn in a manner that wasn’t available even a handful of years ago. I’m excited to see how this technology progresses and what comes of it. There are three-dimensional holographic representations of Holocaust survivors that have been programmed to share their stories with an audience, and they can answer practically any question that is presented to them. We already possess the ability to “beam” them into an auditorium or a classroom. This is fascinating from an education standpoint, as they’ll be able to tell their story in perpetuity, answering questions for generations and generations, if we so see fit. This type of experiential mixed learning is just beginning to untap it’s potential as well, so again, fascinating (and a bit scary) times lie ahead. Lee Carlton: One that certainly stands out is our adoption of Headrush as a project-based learning management system last year. As I’ve touched on above, we’re focused on putting the student back in charge of their learning, letting them explore the concepts and topics that they care about as they explore the world. That wouldn’t be possible with a standardized curriculum, where all students take the same tests, and their successes are based on those scores. We tried that route for a number of years, and the result was our students holing up in hotel rooms and cramming for exams — not exactly the best way to interact with cultures and communities. Through project-based learning, we now provide students with a driving question at the start of the term and let them arrive at their own conclusions. Instead of our educators standing at the front of the classroom, they work alongside the student, providing guidance and making sure their team’s project satisfies the learning targets associated with the module. All of this work is recorded in Headrush at every stage of the project, and it paints a comprehensive picture of the student’s time at THINK Global School. Headrush also shows a student’s progress through the aforementioned learning targets, which are a combination of 21st-century skills and subject categories (there are 122 learning targets in all). Students must achieve the rank of novice in all learning targets, specialist in at least 70% and show mastery of one skill through a mastery project, and Headrush provides us a visual measuring stick to assess their progress in a really easy way. It’s a way that can be passed on to college admissions as well to provide a more complete picture of a student’s learning experience than simple test scores. Lee Carlton: We do have a dedicated in-house IT team who support technology dispersed across multiple time zones and are really in charge of making sure we are set up to operate from a tech perspective in a new location every three months. Our IT guys, Tashi Mar and Scott Murdoch, certainly have a unique operational setup to support. While Headrush has been to their benefit, I’d like to focus on one of the challenges that are more pertinent to their work at THINK Global School. This year we launched a second cohort of students, which means we went from one school of thirty students living and learning in four countries per year to sixty students living and learning in eight countries per year. Not to mention supporting the multitude of educators and remote staff — you can probably see now how they have their work cut out for them. So right off the bat that is roughly 270 devices they have to monitor and troubleshoot regularly (and there are projectors, VR consoles, and much more to boot), as our devices are crucial to facilitating learning and ensuring our educators are capable of tracking student work. We’ve embraced using JAMF, a comprehensive enterprise management software solution that allows the IT department to manage and unify our Apple ecosystem. JAMF’s Self Service application enables us to push out software, content and other resources remotely, which is huge given our nomadic nature — especially since Tashi is based in New York City and Scott is based in Switzerland. Even though they are tasked with troubleshooting device issues from afar (with help from our more tech-savvy teachers on the ground), students and staff have a close rapport with our IT team and pitch in where they can. Hardware and software issues are compiled as support tickets, which gives them a practical way to handle issue tracking. Luckily, our IT team enjoys finding creative ways to solve problems, and depending on our location, anything from reliable WiFi infrastructure to hardware replacement can be a challenge. Lee Carlton: I would say the biggest challenge we are facing right now is getting all of our educators and students on the same page regarding collaboration tools. For some years we used a learning management system called Spot (the primary functions of which have now been replaced by Headrush), which housed our student work and offered access to apps and productivity tools from a useful dashboard. Now though, we are spread out across a number of digital collaboration platforms like Padlet and Flipgrid for our project and module work, which can make things difficult to track. For instance, our cohorts both have different methods of messaging among themselves as well, so even our digital communication methods aren’t aligned. We want to give our staff the freedom to experiment freely with tools, but it’s difficult when half of the team are communicating via Slack while the other half might be communicating through WhatsApp. Adding to the challenge, over the last two years, through the introduction of the Changemaker Curriculum and a second cohort, we’ve added a number of intelligent and highly motivated teachers to our stable who have excellent ideas and edtech solutions of their own. How can we adopt their best ideas and get all of our teachers to utilize them? That’s what we’re trying to figure out, and I’m sure it’s something that all schools, at least those with the freedom to experiment freely with tools, are grappling with. Lee Carlton: We have a number of custom-built apps that we utilize, but no plans on promoting them to the public at this time. Lee Carlton: Twitter is a handy tool, especially when you customize hashtags in an app like Tweetdeck. I spend a healthy amount of time on there and Reddit. Besides that, Teachthought, Edutopia, and Mindshift are some other great sites that deal with all aspects of education, including edtech. As a marketer, I’ve started using Rand Fishkin’s new project, Sparktoro’s trending tool, as a resource to keep up with new innovations on that front. Lee Carlton: Definitely Twitter – the platform certainly has its shortcomings, but in terms of educating yourself, I don’t think any other platforms come close. I love that it forces the author to be succinct, so only the most crucial of information is relayed.